James Henthorn Todd (23 April 1805 – 28 June 1869) was a biblical scholar, educator, and Irish historian. He is noted for his efforts to place religious disagreements on a rational historical footing, for his advocacy of a liberal form of Protestantism, and for his endeavours as an educator, librarian, and scholar in Irish history. He was the son of Charles Hawkes Todd, a professor of surgery, and Eliza Bentley, and was the oldest of fifteen children. Noted physician Robert Bentley Todd was among his younger brothers. His father died a year after he received a B.A. from Trinity College in 1825, diminishing his prospects for success. However, he was able to remain at the college by tutoring and editing a church periodical. He obtained a premium in 1829, and two years later was elected Fellow, taking deacon's orders in the same year. 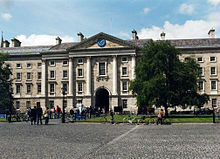 From that time until 1850, when he became a Senior Fellow, he was among the most popular tutors in Trinity College. Todd took priest's orders in 1832. He began publishing in earnest, including papers on John Wycliffe, church history, and the religious questions of his day. He was Donnellan Lecturer in 1838 and 1839, publishing works related to the Antichrist in which he opposed the views of the more extreme of his co-religionists who applied this term to the Roman Catholicism and the Pope. In 1840 he graduated Doctor of Divinity. In 1837 he had been installed Treasurer at St. Patrick's Cathedral in Dublin, and would become Precentor in 1864. His style of preaching was described as simple and lucid, and his sermons interesting. He co-founded Saint Columba's College in 1843, a school which promoted the Irish language for those who intended to take orders, as well as promoting the principles of the Church of Ireland. In 1849 Todd was made Regius Professor of Hebrew at Trinity, and a Senior Fellow the following year. In 1852 he was appointed Librarian, and working alongside John O'Donovan and Eugene O'Curry, he classified and arranged the collection of manuscripts. When his office received money, he spent it on the acquisition of manuscripts and rare books, and he deserves much credit for the library's high ranking as one of the chief libraries of Europe. His secular achievements were no less remarkable. In 1840 Todd co-founded the Irish Archaeological Society and acted as its honorary secretary. He was elected a member of the Royal Irish Academy, and strove actively to acquire transcripts and accurate accounts of Irish manuscripts from foreign libraries. He was honorary secretary from 1847 to 1855, and president from 1856 to 1861. In 1860 he was given an ad eundem degree at Oxford. Todd was a notable person among notable people. His work was widely respected and cited. Among his friends and acquaintances were lawyer and poet Sir Samuel Ferguson, Conservative MP and Roman Catholic convert Edwin Wyndham-Quin, fellow historian William Reeves, artist Sir George Petrie, and the Stokes family (physician father William, future lawyer and Celticist son Whitley, and future antiquarian daughter Margaret). James Henthorn Todd died at his house in Rathfarnham on 28 June 1869 and was buried in the churchyard of St. Patrick's Cathedral. "Todd, James Henthorn" . Dictionary of National Biography. London: Smith, Elder & Co. 1885–1900. Webb, Alfred (1878). "Todd, James Henthorn" . A Compendium of Irish Biography. Dublin: M. H. Gill & son – via Wikisource.